Are Reports Anonymous on Facebook ? Facebook is a kind of global network websites which help us to meet our friends and family members. However there are always some people who are using this opportunity for bad goals. People can annoy you with harassment, with bad speech, frauding, pictures, fake accounts, second accounts, etc… You can always report those to Facebook staff. However sometimes we want our reports to be anonymous… One of users was already curious about that and asked that if reports are anonymous on Facebook. We are going to answer this question on here. We hope our answer is going to be useful for those who has similar question in their mind. If it is not, you can ask your detailed questions with comment this page. 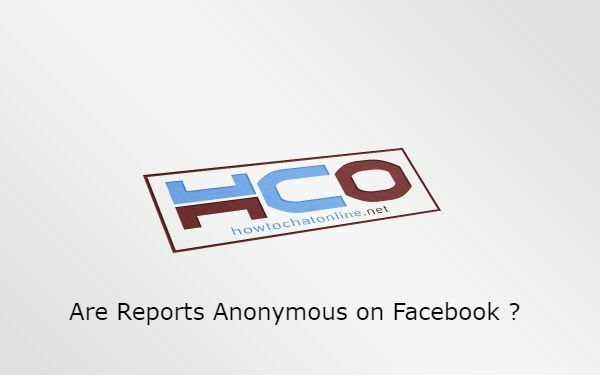 Yes, reports are anonymous on Facebook. The user whoever reported by you will never your identity but he will know that he/she got reported for something he has done. It can be harassment, fraud, inappropriate pictures or explanations, fake account or second account. Facebook doesn’t generally tolerate these. If you are right in the case, your report will be approved. If you are mistaken, they will ignore your report soon after they investigate. So no one will find out it. This generally depends on situation. If you report a status or a picture, this process is going to end soon. It can be in a week. However if you report a profile, this can take longer time at times. However if Facebook staff ensure that it is a fake account or second account in a short time, that will not also get a long time. Sometimes people use those accounts for frauding. Facebook staff generally have the fastest reactions against fraud. You can report fraud accounts to Police also, see: Can Police Find a Deleted Facebook Account? ← Is Second Account Allowed on Facebook?